A modern twist on the classic survival bowie knife! 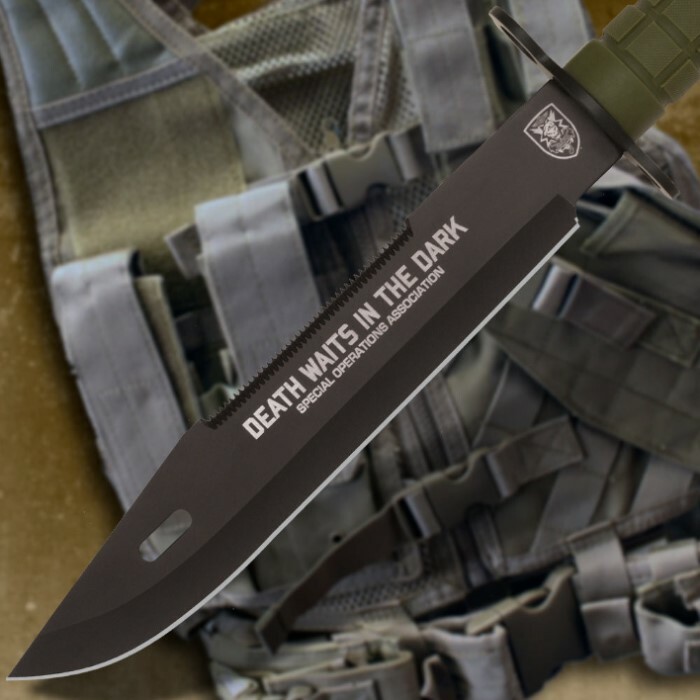 This fully functional piece was designed to honor military Special Operations, and includes a "Death waits in the dark" slogan right on the blade. The blade is forged from stainless steel, given a baked on black finish, and includes a saw on the blade back/spine. The over-molded rubber handle offers a secure grip, even when wet, and is naturally shock absorbent. The bottom of the handle unscrews to reveal a survival kit complete with a waterproof compartment, fishing line, a hook, three matches, a suture kit, a compass, and a razor blade. Includes a nylon sheath with belt loop and reinforced liner. 9 3/4 in. blade, 15 in. overall. Really cool knife! Sharp, feels sturdy and the survival kit is nice. It has a little bit of extra room in the pommel, could fit some twine or other small items in there. The sharpening stone seems low quality, threw it out cause it wore away quickly. Had to exchange it due to a faulty compass but I'm very happy with the way it was handled. I was very impressed, it came sharp right out of the box. And soon I will take this with me on camping trips. This is exactly what I wanted. No disappointments here. Will be putting it through the real test soon, but am confident it will hold up fine. LOVE Ya BudK !!! I just got my new survival knife! 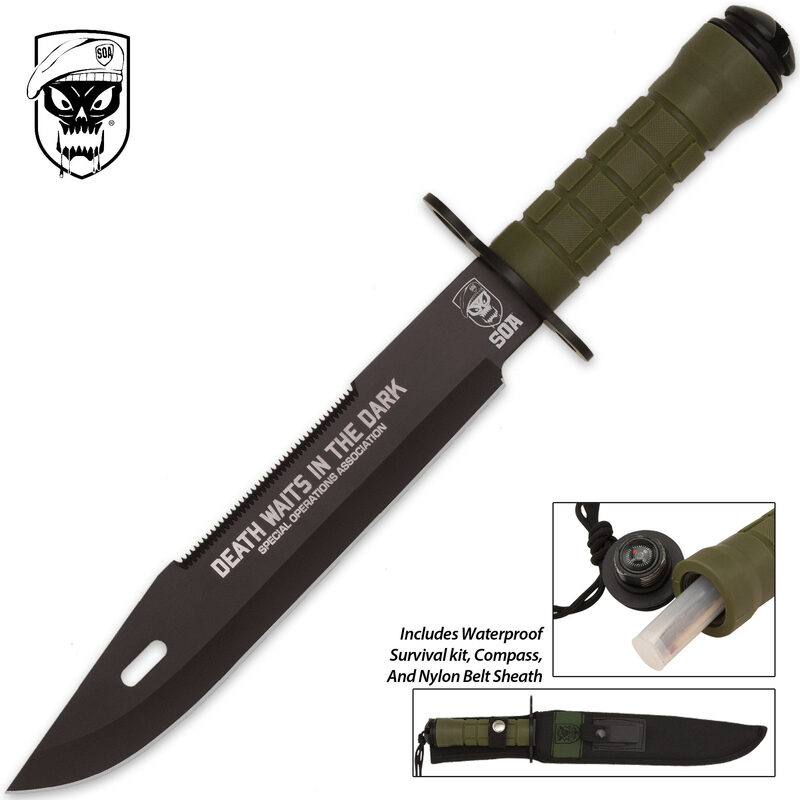 Its the 'S.O.A Death In The Dark Knife & Sheath'. I was so thrilled by it I ordered another one for my son! Heck they are having the 1 Penny shipping, had to take advantage of that. I will for sure brag about this knife to my Survivalist friends. Thanks for your great deals and fast shipping! This was just what I was looking for to go with bug out bag gear. Good edge, nice basic survival kit, sturdy and a good feel. I wanted practical and functional. Most of the saw backs on these knives are useless. This one you can actually use and works pretty well. you won't cut down a tree but for kindling and small branch trimming it does the job. I was a bit skeptical at 1st b/c of the price but than I got it & right away I can tell that this knife is sick. Very sharp. Heavy duty. Solid. Great quality, great quality Sheath as well. Well worth it. I am very pleased. I got this knife very quickly; in about 3 days. I opened it out of the box, and it was pretty dull, but I sharpened it and its really sharp now. Very sturdy and the stabbing point is very sharp. Good guy True Swords.